There are about eight different property crimes listed under the arson and burning laws, and each requires that the government prove that the defendant acted intentionally. In our experience handling these types of cases, we have seen the state try to prove intent using a variety of tactics. For crimes such as malicious burning the state typically tries to introduce evidence that the defendant had some sort of motive to harm the alleged victim. This is the case for arson charges as well. The owner of the property that was damaged and the defendant usually know each other, and in most cases don’t like each other. But sometimes there is no alleged victim, as these crimes do not require that the property belonged to someone other than the owner. If a defendant is accused of setting fire to his or her own property, the state still has to prove that he or she did so with malicious intent. If someone accidently burns his or her home or other property there is no crime. It doesn’t matter if the property owner was negligent, as all crimes must have some element of criminal responsibility. As mentioned above, the criminal responsibility element for the Maryland arson and burning laws is defined as malicious intent. When a defendant is accused of burning his or her own property, the state will usually try to establish this element by alleging an intent to defraud. Insurance fraud is one of the most common reasons that fires are started intentionally. But by no means are we suggesting that most fires are in fact intentional. The problem is that even when a fire is an accident, the prevalence of insurance fraud can lead the fire department, police, and State’s Attorney on a witch-hunt to find a crime, where one was actually never committed. This often leads to false accusations, which can severely damage a person’s reputation, not to mention subjecting them to a permanent criminal conviction and possible jail time. If you or someone you know has been charged with burning with the intent to defraud contact the defense lawyers at The Herbst Firm immediately for a free case evaluation. We are available 24 hours a day to discuss the possible defenses that may be available to you. Homeowners and businesses typically have large insurance policies that can be worth far more than the properties they cover. 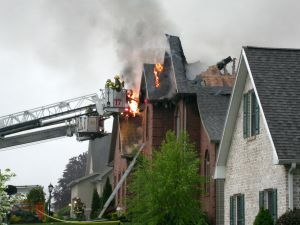 Whenever a fire occurs at a home or business, the fire department conducts an investigation to see whether there are signs of an intentional act. If the fire marshal is not convinced that the burning was an accident, an arson detective is usually summoned to the scene. Many police departments in Maryland have their own arson investigation units with detectives that work closely with insurance companies and the fire department. Baltimore City has multiple detectives that handle these types of crimes, and they can recommend charges to the State’s Attorney even if the evidence does not support a criminal conviction. Unfortunately when it comes to arson and burning offenses the police would just assume to make and arrest and let the court system handle the case. Do not walk into the courtroom without experienced representation, as there is simply too much at stake.